Chattanooga fiddling legend Fletcher Bright, 82 years old and still fiddling strong, joins forces with Bay Area banjo favorite Bill Evans in a very special one-time-only concert celebrating the duo’s new album, Fine Times At Fletcher’s House: Fiddle and Banjo Music from Lookout Mountain, Tennessee. In addition to generous helpings of the fiddle and banjo duets that grace this new recording, Fletcher and Bill have enlisted long-time musical friends Laurie Lewis, Tom Rozum, and Sharon Gilchrist for an evening of exciting traditional bluegrass in the spirit of Flatt & Scruggs and Bill Monroe. 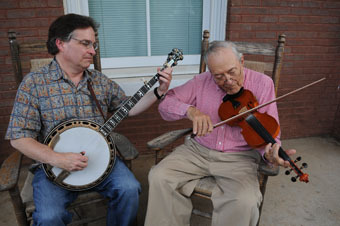 For over seventy years, Fletcher has been fiddling up a storm in his home state of Tennessee. He was on the scene when Arthur Smith’s 78 rpm records were the hottest fiddling around. He was there when bluegrass was created and perfected by Monroe, Flatt, and Scruggs, and, like so many other young fiddlers – he was in high school at the time – he fell in love with the blazingly original fiddle of the great Chubby Wise. Naturally, he formed a band, The Dismembered Tennesseans, which still tours widely throughout the Southeast today. In fact, he has kept listening, playing, and teaching through the succeeding decades, absorbing more contemporary styles while staying true to his Tennessee fiddling roots. An inspirational and infectious performer, Fletcher’s sheer joy of music making is contagious. He has been the musical inspiration for scores of musicians, from Noam Pikelny to Missy Raines, and he is one of a handful of first generation bluegrass musicians still making vital and vibrant music today. This is Fletcher’s first appearance in the San Francisco Bay Area. The website The Revivalist calls the new album “a gloriously impromptu affair, a series of lively and joyful duets with the great American banjo player and scholar Bill Evans.” Bill, of course, is a Freight favorite who’s recently appeared here with David Bromberg, Melody Walker & Jacob Groopman, the Hard Road Trio, and the Jazzschool Bluegrass Ensemble, which he directs. Bill and Fletcher have been making music together for more than a decade, so why not get together for a few days in Fletcher’s den and record a collection of great tunes? Missy Raines calls Fletcher “one of those rare musicians whose sheer love of playing pulls you in, latches on to your guts, and changes you, if you're lucky enough to hear him.” Tonight you can be lucky enough to hear him, and Bill, and their pals Laurie, Tom and Sharon, so come on down!